Welcome to the Sun Corridor MPO website! The 2010 Census determined that the City of Casa Grande had reached a population over 50,000. As a result, federal law requires that a Metropolitan Planning Organization be formed to provide transportation planning within designated boundaries. 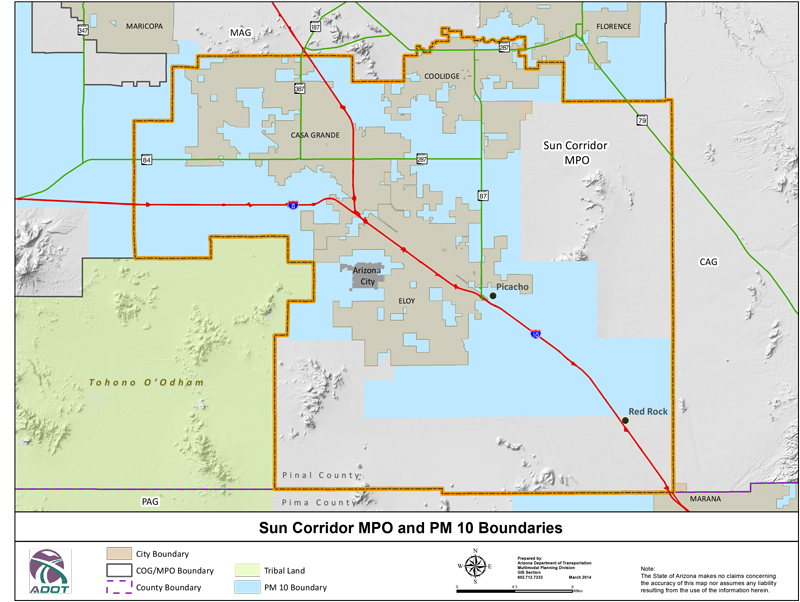 The Sun Corridor MPO provides transportation planning services to the communities of Casa Grande, Coolidge, Eloy and rural portions of Pinal County, and covers 1,155 square miles, with an estimated population of nearly 120,000. The Sun Corridor MPO is a strategically located corridor in which economic growth is expected to thrive.